Six months ago, I received my shipment containing Apple’s newest gadget, the Apple Watch. I’ve been wearing it every day since, and I get asked quite a bit what I think of it, and whether it’s worth a purchase. For me, the answer is yes, but it may not be for everyone. You have to understand that I’m somewhat of a gadget addict. I like new technology and tend to try everything as it comes out. So I was excited to receive this new toy and put it through its paces. So what does it do well? For starters, it’s a great fitness band. If you are used to wearing something like a Fitbit or a Jawbone, the Apple Watch serves the same purpose and serves it well. It counts steps and calories burned, can track workouts, and even has a heart rate monitor. All of this data flows into the Apple Health app on your phone, and allows you a really nice way to keep metrics on how much you move throughout the day. It also measures if you’ve stood up and moved every hour, and if not, it reminds you to at ten minutes to the hour. Some people find that annoying, but for me it does remind me if I’ve been sitting at my desk for too long. It also tracks your calories burned, how many hours you’ve been active throughout the day, and how much exercise you’ve gotten in a nice display of three circles. The closer you get to your daily goal, the farther the circle goes around. Some people find that to be quite the motivator. There are also awards you can get for doing things like filling the circles every day, or going a whole week or month filling the circles. I’ve known a few people who have used this quite successfully for motivation. Now the Apple Watch is meant to be put on its charger every evening, so it’s not something you wear overnight. This means that there is no built in sleep tracking. There are a couple of third party apps that can do it, but I think most people don’t want to have to keep an eye on their battery that closely to make that work. That’s not to say battery life is bad. It easily lasts a day. Most days when I put it on the charger at night I have at least 60% battery life left. But, I don’t do any major exercise, so for those of you that do, that battery will drain more quickly as exercise utilizes the heart rate monitor for the duration of the workout. Other than the fitness aspect, the Apple Watch is a decent, informational timepiece. You have your choice of multiple watch faces that can show as much or as little data as you wish. There are data heavy faces, fun faces like Mickey Mouse and Photos, or even ones that look like their analog counterparts. Most faces allow you to customize what data is shown via “complications.” Complications are the various pieces of data you can show on the watch face at any given time. 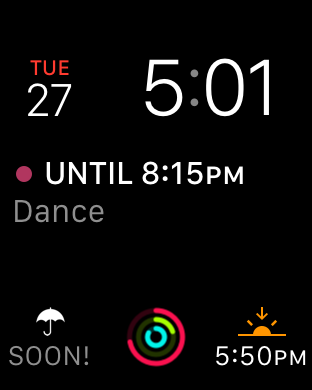 For example, on the main face I use, called Modular, I have a complication that shows the date, one that shows calendar info from Fantastical, weather info from Dark Sky, my fitness progress and the Sunset/Sunrise time. It’s quite a bit of data to see at a glance, and I have it set up just like I want it. You have quite a few options to choose from to find something that works well for you. Another nice thing is that the watch allows you to receive notifications from your phone directly on your wrist. You can tailor which notifications you want to allow, and I definitely suggest you pare it down to the bare minimum you care about. Otherwise your wrist would be buzzing constantly. I set mine up to get notified of texts, some email, and a couple of social networking things, but I let my phone handle the rest. I do really like the ability to be notified of something and quickly check my wrist rather than having to pull my phone out of my pocket. Now I have noticed that social norms have not caught up to this quite yet. I try to be discreet when I look at my wrist, but if you are talking with someone and they notice, they think you are looking at your watch to check the time and rush the conversation along. I’ve had to apologize to people a couple times and explain that no, I’m not trying to get rid of them, I just got notified of something on the watch. Checking the watch can definitely be construed as rude behavior by some folks, although it’s no more rude than pulling out your phone. That said, I only try to do it discreetly to see if something really needs my attention. I’ve also found that it’s great for things like waiting in line, or sitting in a meeting or other situations where a quick glance allows you to notice the information, but no one thinks you are being disruptive. Another thing you can use the watch for is Apple Pay. Apple Pay allows you to connect a credit or debit card to your phone and watch, and you can pay simply by touching your device to compatible credit card readers. I’ve paid with my watch at a variety of places including Walgreens, McDonalds and Best Buy. It’s very easy, more secure than swiping your card, and fast. I could even leave my house and leave the credit cards at home. The way Apple handles the security on this is pretty clever too. Once the watch is on your wrist, you authenticate it by using the fingerprint reader on your phone. Once you’ve proven it’s you with the fingerprint, the watch is authorized on your wrist until it loses skin contact. Once it loses contact, it locks and cannot be used for Apple Pay until you re-authenticate with your fingerprint. The last major thing you can do on the watch is install apps. There are tons of different apps out there and quite frankly, most of them I’ve run across aren’t that great. There are exceptions, but so far, app developers haven’t done the best job of making apps run quickly on the device. There is a lot of waiting and refreshing, and many times it would simply be faster to pull your phone out of your pocket. That said, there are a couple apps I love. One of them is Overcast. Overcast is a podcast player that allows you to subscribe to and play back podcasts. For me, I mount my iPhone in the car to use as a GPS. Most times I have Overcast playing in the background with the GPS up on the screen as the foreground app. So before, this meant that if I wanted to do anything in Overcast, I would have to close the GPS and switch to Overcast to do things like switch podcasts or fast forward through parts of the episode. This is obviously a dangerous thing to do while driving. Since I have Overcast as an application on my watch, it’s very easy for me to make those changes while still keeping my eyes on the road. I use that constantly, and it’s made my commute that much better. Another fun one is the Philips Hue app. Philips Hue are lightbulbs that can change color at your command. 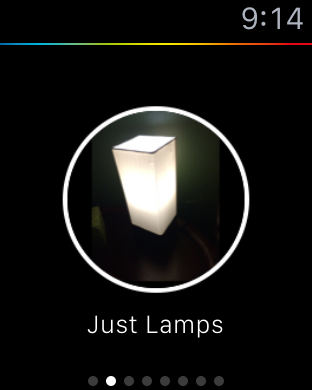 I have an app on my phone that allows me to turn on lights, dim them, change colors and more. Well the watch app allows me to do the same thing. So when we are getting ready to watch a TV show I can pull up the app on my watch and easily turn off the lights. It’s kind of a dumb thing, but I find myself using it all the time. The last one that’s gotten a large amount of use is storing my boarding pass for Southwest airlines on my watch, and using it to board the plane. When you check in for a flight on Southwest, you can get a QR code on the Southwest app on the phone. You can then save that QR code to the Wallet app on the phone. Once it’s there, it’s also available on the watch. When I get in line to board a plane, I simply pull up the code on my watch and wave it under the scanner and board the plane. It’s sparked a lot of conversations with other passengers and I’ve probably sold a couple Apple Watches based on that alone. It’s a simple thing, but works elegantly, and has made boarding a plane a tad more enjoyable. The last major thing I enjoy is the Siri support on the watch itself. If you raise the watch and say “Hey Siri” you can do all sorts of things. You can initiate a phone call, text someone, search for things, and the one I use the most, set reminders. For example, my most used reminder is “Hey Siri, Remind me to check the laundry in an hour.” That automatically sets up a reminder for an hour from now that will buzz on my wrist when it’s time to switch out loads of clothes. I do little reminders like that all the time, and it’s incredibly handy. Imagine having your hands dirty while cooking and you want to set a timer, just raise your wrist and ask Siri to make it happen. It’s really a nice feature. As for style and comfort, I purchased the black aluminum with black band and I think it looks really nice. The flouroelastimer band (i.e. fancy rubber-like material) is very comfortable, and I like the fact that you can easily change out bands to match outfits or types of events you might attend. I haven’t bought any of the additional bands myself as they can be somewhat pricey, but I think I’ll probably get one or two more down the road. So, the question is, am I happy with my purchase? For me yes, it’s not a world changing gadget by any means, but it does a lot really really well, and it does make my life easier and more quantifiable. If I was a mile down the road in my car and forgot it at home, would I turn around to go get it like I would my phone? No. If I walked down to the garage and forgot it, would I walk back upstairs to make sure I had it? Absolutely. It does enough that I miss it and want it with me. And really, isn’t that what a good gadget is all about?